An SBR is a form of activated sludge treatment that utilizes fewer tanks than conventional activated sludge treatment methods. 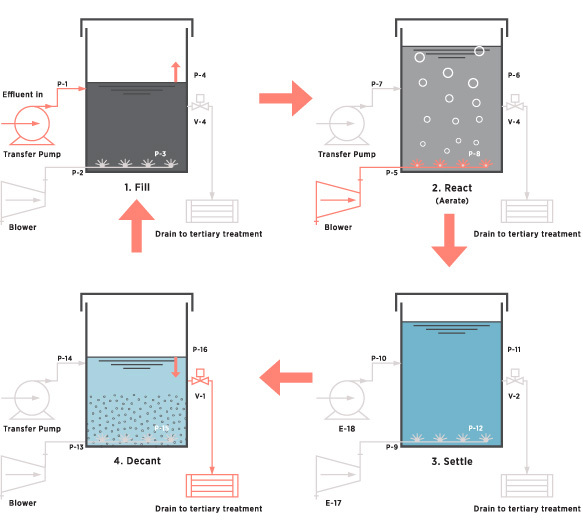 The treatment process is achieved by operating the tanks in different cycles or stages. There are five stages in the treatment process: Fill, React, Settle, Decant and Idle. Aeration of the mixed liquor is performed during the first two stages by the use of fixed or floating mechanical pumps or by transferring air into fine bubble diffusers fixed to the floor of the tank. During the settling stage the sludge formed by the bacteria is allowed to settle to the bottom of the tank. The clear water at the top of the tank is then drained off as treated effluent. As the bacteria multiply and die, the sludge volume within the tank increases over time, a portion of which must be removed periodically. The quantity of sludge within the tank is thus closely monitored, as this can have a marked effect on the treatment process. The efficiency of the process is also largely determined by the settling ability of the sludge which is also affected by a number of different parameters. These factors combined mean that SBR systems require more attention and tend to be less stable than their MBR counterparts.